Prachi is surpised to find Rhea's necklace in her pocket. How will the family react to this staged robbery? In tonight’s episode of Kumkum Bhagya, Rhea’s lost necklace is noticed by someone during the cake-cutting. When Rhea is surprised and says that her necklace is lost somewhere, the entire house is searched by family, as well as guests. When no one finds the necklace, Rhea accuses Prachi of stealing the necklace during the dance. 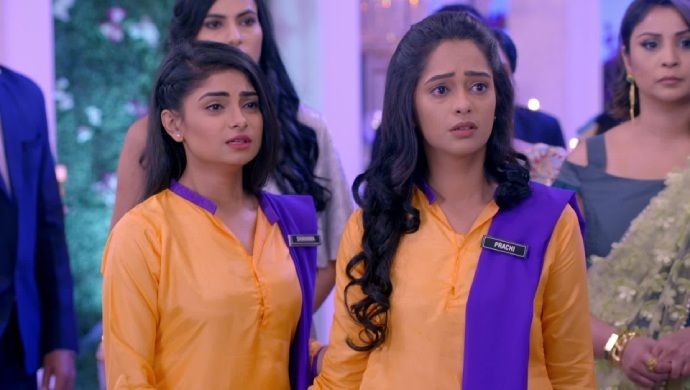 In the next episode, Aliya stands behind Rhea’s theory of Prachi robbing her necklace and suggests to check if Prachi has the necklace with her. She is well aware that Rhea has planted the necklace. While everyone in the house, who took a liking to Prachi, is against the idea of doing a check. Aliya completes Rhea and her plan of framing Prachi for robbery. While Aliya conducts the check, Prachi is taken aback when the necklace is found in her pocket. How will the family react when the girl that reminds them of Pragya is caught for stealing a necklace? Stay tuned to find out.